Wellness Patrol: You've Eaten Something from a Food Recall; Now What? You've Eaten Something from a Food Recall; Now What? Last month, no less than four major food recalls made headlines, making everyone freak out about walnuts, mac 'n' cheese, and more. And just last week, certain potatoes were recalled after being linked to botulism. And it doesn't stop there: So far this year, federal health authorities have issued several hundred recalls. The U.S. Department of Agriculture (USDA), which handles most meat and poultry recalls, has issued seven in just the last week. And that's far from uncommon, according to their full list of recalls and alerts. 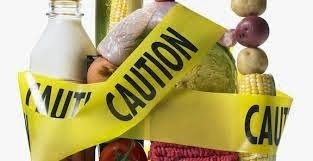 The Food and Drug Administration (FDA), which oversees most other food products—from sauces and spices to produce—lists more than 60 recalled food items in its most recent weekly enforcement report. When it comes to meat, the concern is usually sickness-causing bacteria like salmonella or E. coli, or parasites like trichinella or cryptosporidia, says Robert Tauxe, M.D., deputy director of the Division of Foodborne, Waterborne and Environmental Diseases at the Centers for Disease Control and Prevention (CDC). "The risk of contamination multiplies when the meat trimmed from many animals is ground together," Tauxe says. That makes hamburger or ground pork, lamb, and turkey especially problematic. If you're not feeling well, "definitely see a doctor or physician," Tarrant says. "Let them know you've eaten a recalled product, and tell them what you know about the recall." That will help your doc treat you appropriately, and will allow him or her to notify the CDC and state health department about a risk to other consumers. So what do you do if you bought or—gulp!—ate a recalled product? First of all, don't freak out. Tarrant says many recalls are issued because evidence of a problem turns up at a food manufacturing or processing facility, not because people are getting sick. She recommends reading the USDA or FDA's press releases on the recall, and monitoring yourself for signs of illness. If you become very sick, skip your doc's office and get to a hospital, Tarrant says. Again, be sure to let them know if you believe you've eaten a recalled food product. As far as medical compensation goes, Tarrant says that's a legal issue between you and the food manufacturer, distributor, or store—depending on who's at fault. Chances are good that whoever sold you toxic food is going to want to make things right. "But that's not something the USDA or FDA oversees," Tarrant says. When it comes to product refunds, she recommends checking the recall press release from the USDA or FDA. Typically, whoever sold you the product will issue a refund. So there you go: the ins and out of food recalls. Now, who's hungry?